Born in Montreal in 1922, Mavis Gallant abandoned a successful job as a newspaper columnist (a young woman with her own column, not writing about recipes, or fashion, or society parties!) to go off to Paris to be a writer. This was in 1950, and at first she went through hard times, once having to sell her clothes for food. Then the New Yorker recognized her skill and she became a regular contributor. In time she was recognized almost everywhere as a superb short story writer. But not in her native Canada, where her books were ineffectively distributed by her American publisher, and not widely known. Mavis responded positively, changing some of the stories around and hoping that I had my shirt “tattooed on my back” — otherwise, she warned, I was certain to lose it. Home Truths won the Governor General’s Literary Award for 1981, and in an important sense, brought Mavis home. And my shirt remained on my back. 1. The introduction she wrote at my request allowed Mavis to express some of her frustrations as a Canadian living abroad (“I have been rebuked by a consular official for remarking that Rome in winter is not as cold as Montreal; and it surely signifies more than lightheadedness about English that ‘expatriate’ is regularly spelled in Canadian newspapers as ‘expatriot.’ Whether they know it or not, Canadian artists are supposed to ‘paint Canadian.’”) What do you think of her view of Canada? And her view of the role of Canadian artists? 2. “I can vouch for the city: my Montreal is as accurate as memory can make it. . . . Memory can spell a name wrong and still convey the truth.” Then Mavis quotes Jean Cocteau saying, “I am a liar who tells the truth.” Is this really, as she says, “the last word” about the writing of fiction? And is it true that a book called “Home Truths” can give a really honest, truthful picture of Canadians when one third of the book is set in Europe? Or is that an advantage? 3. The very first story, “Thank You for the Lovely Tea,” is worth following in detail, to see how cleverly Mavis puts together a story that seems very simple. I like how the story opens with an all-seeing narrator describing the school that rainy June day around 1930. Then we see it through the bored eyes of Ruth, who, looking out the window, sees Mrs. Holland approaching, appearing “smart but smudged.” Next, we see the school through Mrs. Holland’s over-awed eyes, then her through the disapproving eyes of the headmistress greeting her, and then in turn we meet Ruth’s young friends May and Helen. Does this skilful storytelling remind you of anyone else? For you, which of the characters stood out? What does Mrs. Holland really hope to achieve by taking Ruth out for tea? How would you rate her prospects? Who, for you, is the most striking character? And since the title deals with a frightening fairy story, what do you think really happened to Irmgard in “the kidnapping” incident, and what was “the disaster” that befell young Freddy? Ambiguity is often one of the hallmarks of Mavis’s stories: what do you think of it here? Brilliant! And every page, from the first one setting the winter scene — “A few people, bundled as Russians, scuffled by” — has little explosions of fine writing. But for me the most important paragraph is the central one about the marriage between the old man and his young bride: “Presently what they had in common was her physical horror of him and his knowledge of it, and then they had in common all their children.” What can you say about that dissection of a marriage? And what do you think of the fact that the mother (“who flings out whatever she feels, no matter who is in the way”) clearly has a special love for the unusual Gerard, while her elderly husband has a special relationship with his youngest son, Leopold (“whose five sisters think his intelligence is a disease, and one they hope their children will not contract”)? 6. “Up North” is a very unusual story, taking us on a train away from Mavis’s usual city streets, way up north with “Den and his Mum.” She’s a late-arriving war bride, which makes this 1947 story almost a historical snapshot. Did you notice how the word “sor” tells us a lot about young Dennis right away? And what did you think of the very subtle way the story handles “Indians,” with their gruff train friend Roy McLaughlin clearly suspecting that Dennis’s dad, met in uniform in England, might prove to be an Indian here — since the name Donald Cameron “meant nothing” up north? (I remember that Barry Broadfoot’s Six War Years contains true stories of Cockney war brides amazed at being greeted by blanket-clad in-laws when they reached their husband’s home station.) How ironically does Dennis’s cry “I want to see some Indians” resound here? 7. “Orphan’s Progress” allows Mavis to draw on her own horrendous childhood, where her thoughtless parents shunted her between seventeen different schools, starting with boarding at a Quebec convent school “four weeks after my fourth birthday.” Like Mildred in this story she had to “wear a rubber apron in her bath” to stop her from seeing forbidden regions. How do you think her experience affected her telling of this sad story of Mildred and her big sister Cathie? Can you see other details that probably emerged from Mavis’s own memory? And did you catch the importance of the garage that Mildred ignored? 8. “The Prodigal Parent” seems to me different from all the other stories here. If you agree, do you think it’s because the setting is the west side of Vancouver Island (I guess Tofino) and thus on the edge of the Pacific, not usual Mavis Gallant territory? Or is it because, in his “worn blazer and a regimental tie,” Rhoda’s father is telling the story from a definitely masculine viewpoint? And what did you think of Rhoda’s final, yelled line, “You’re only my father. That’s all you are”? The place is “The Tunnel,” and it lies behind the centre of their world, the home of two older English exiles, Tim and Meg, who enjoy “a good old fry-up,” almost as much as they enjoy ignoring France. Which of these (let’s call them “decisive”) characters appealed to you most? What did you think of Lisbet, Meg’s niece, who has an interesting relationship with Roy, once saying, “Look Sarah, how old are you? Aren’t you a bit out of your depth with Roy?” And was Sarah really out of her depth? 10. “The Ice Wagon Going Down the Street” seems to me to be about privilege. Peter Frazier (whose father once told him, “Nothing can touch us”) comes from a wealthy Canadian family and lives his life expecting the Frazier name to open doors for him. Even when he’s stuck in a low-level clerk’s job with an international agency in Geneva, he assumes that “they” are biding their time and will promote him in due course. Instead, he finds himself working for Agnes Brusen, another Canadian, but a very different type, a charmless, hard-striving girl from a simple Prairie family. The story’s title comes from a rare moment when Peter makes a genuine connection with someone else, with Agnes emotionally recalling for him a scene from her childhood. What did you think of that relationship? And what about Peter’s attractive English wife, Sheilah (who grew up “rat poor” in Liverpool but is unwise to mention it)? How important to the story is his sister Lucille, a realist? But Peter and his family, including the two girls, have been living in Lucille’s small Toronto apartment for seventeen weeks. What do you think will happen to Peter, Sheilah, and the girls? 11. In “Bonaventure” young Douglas Ramsay, born and raised in Montreal, is a musical prodigy. Now, however, at the age of twenty, “The voices had stopped; no one is ever likely to say, ‘Are you really only twenty?’” But he is honoured by being taken from his studies in Berlin to spend the summer at the lavish Swiss home of the legendary conductor Adrian Moser. His hostess is Moser’s widow, Katherine, whose intentions towards the young man are not crystal clear. Since we see the story through Douglas’s eyes, did you find Katherine hard to decipher? And what did you think of the range of other characters, such as Katherine’s friend Nanette (“sharing a cottage with a gendarme Englishwoman”), Katherine’s young daughter Anne (once approached, improperly, by Nanette), and Anne’s young friend Peggy? Douglas’s parents remain, for me, shadowy figures. We know that he was closer to his father, who was a POW after the Dieppe raid. Re-patriated, he met his wife again at Bonaventure Station, which gave its name to the story. Are you surprised by the emphasis placed on that returning moment? And what picture do you have of the prodigy’s parents, especially his mother? 12. “Virus X” may be set in Europe, but its characters behave as if ethnicity is fate. Lottie Benz is a WASP from Winnipeg, a grad student who prides herself on being cool and rational (“checking herself lest she became introspective and moody”). In Paris she meets up with another girl from Winnipeg, Vera Rodna, and “Lottie could not help thinking how hunkie she looked.” But if Vera’s Ukrainian background (the source of Lottie’s slur) influences her life, Lottie, as the daughter of a teacher with a German name whose career was held back by it, finds herself reluctant to set foot in Germany. What stood out for you in the relationship between the two Canadians as they travelled about Europe, in sickness and in health? And what did you make of Kevin? So, with all six stories, I think we can regard them all as autobiography, with a few details changed. Certainly, although they were written at different times (1975, ’76, and ’77), they read like one continuous piece of writing, from the same clear-eyed point of view. The first story, “In Youth Is Pleasure” is a straightforward account of young Mavis/Linnet’s return to Montreal. What do you make of her luck in finding her old friend, “the woman who had once been my nurse,” at home, alive, and eager to take her in? A whole life seems to have depended on that piece of luck. Or would the penniless Mavis have found a way to survive? 14. “Between Zero and One” shows us the world of men in a wartime office, adapting to a woman among them. Did you find the picture easy to believe, especially the scene where, with all the men at their desks listening to an office quarrel, the boss comes down on Linnet’s side by remarking that he once knew her father? And what did you make of the role of Mrs. Ireland “from Trahnah,” who instead of being a feminist standard-bearer says, “There’ll not be a girl in this office again, if I have my say”? 15. “Varieties of Exile” seems to me the most unexpected story here. It begins with young Linnet’s fascination with refugees from the war (and already we can see how Mavis was being drawn to Europe and to what Robert Fulford called her “grand theme” which “has been the movement of populations”). That leads to a marvellous essay on The Remittance Man, and to an account of Linnet’s getting to know one such man, a fellow commuter named Frank Cairns. What did you think of their romance? Was it real? And were you moved by the death of Major Cairns in Italy? And what about the casual mention that Linnet was engaged three times during this period? 17. “The Doctor” tells us about the family doctor, Dr. Chauchard “transformed into jolly Uncle Raoul (his request).” But it’s even more about old Montreal, where the “overlapping in one room of French and English, of Catholic and Protestant” was as unlikely, “as unnatural to the Montreal climate as a school of tropical fish.” Did this ring true to you? And the fact that a man could be well-known as a writer in French yet be known to the English-speaking world only as a doctor? The most memorable character for me is Mrs. Erskine, with her “enviable biography,” who had been married to two diplomats. Astonishingly, she took a walk in the snow with a younger admirer, then “opened her fur cloak and said, smiling, ‘Viens voir Mrs. Erskine.’” Mavis, of course wickedly adds the details of her lisp to this invitation, and speculates on whether they then lie down on the railroad tracks or beside them. Do you have an opinion? 18. “With a Capital T” is a very important piece because it tells us about Mavis’s early training as a writer. The key moment in this story, I think, is when Linnet overhears one of the editors saying, “If it hadn’t been for the god-damned war we would never have hired even one of the god-damned women.” Linnet/Mavis now knows the situation. How does she adapt her work? And what did you think of the reappearance of her godmother, Georgie Henderson, as the subject of an interview piece? It seems to me to emphasize just how intertwined these stories are, just as, I believe they are intertwined with Mavis’s real life. 19. In Home Truths, do you prefer the stories set in Canada to those set in Europe? 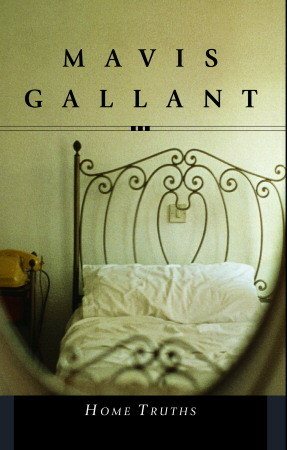 Have you read any of Mavis Gallant’s other collections of short stories? Which did you like best? And was the setting important in that choice? 20. What seems to you most distinctive about her storytelling style? What tells you that this is Mavis Gallant you are reading, whether it is Home Truths, From the Fifteenth District, The Selected Stories, or her most recent collection, 2009’s Going Ashore? 21. Fran Lebowitz summed up the adulation other writers have for Mavis Gallant by writing: “The irrefutable master of the short story in English, Mavis Gallant has, among her colleagues, many admirers but no peer. She is the standout. She is the standard-bearer. She is the standard.” Do you agree? Do you prefer any other short story writer? Mavis, born in 1922, continues to live in Paris, under the watchful eyes of friends. The world hopes that the diaries that she has been keeping for sixty years will eventually see the light of day. Are you reading along with the Storytellers Book Club? Share your questions and observations about Home Truths with Doug in the comments below.